There is an art to conducting a classroom observation that fairly depicts a teacher’s performance in the classroom. Nothing is more frustrating for a teacher than having an outsider watch you teach for a small snippet of time, come to a conclusion about your instructional proficiency and then put that rating score in your permanent file, forever labeling you as such. Having a thorough process in place to ensure every classroom observation is performed with clarity and precision is key to a fair evaluation process that can inspire growth in teachers. This is the third post in the Instructional Coaching blog series. We have previously talked about preparing the behind-the-scenes tasks of an instructional coach, how to plan and manage coaching cycles, and how to provide models of expert teaching. 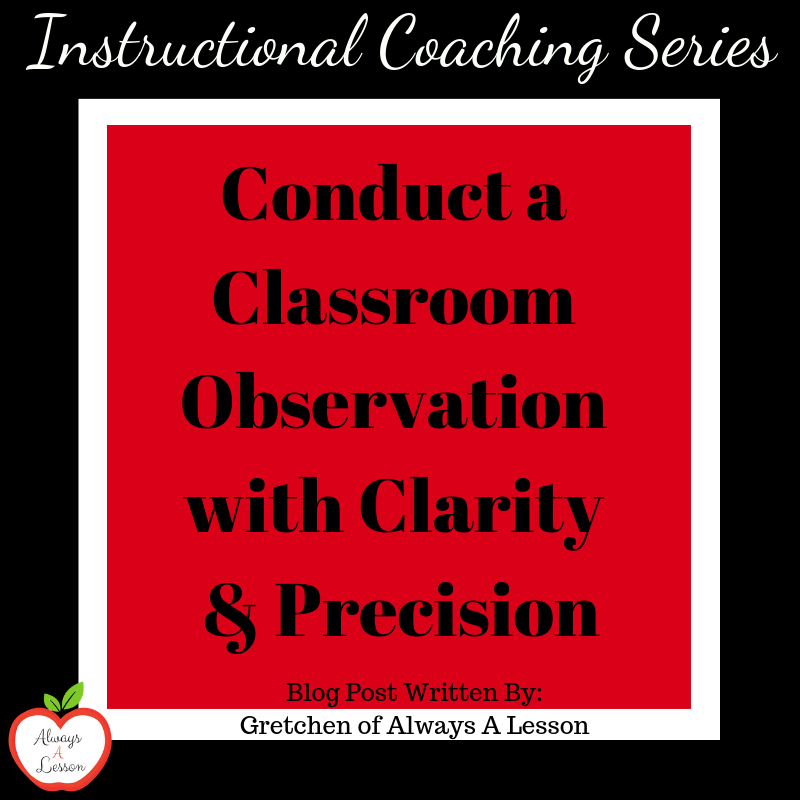 Today we will talk about conducting a classroom observation with clarity and precision. Instructional coaches should meet with teachers prior to an observation. This is helpful for newer teachers or teachers needing intense support to increase their proficiency in the classroom. There is no reason to observe a teacher if they are not going to be adequately prepared to showcase their abilities. A pre-observation conference helps a new teacher learn lesson planning best practices, collaborate with an expert educator, and proactively address potential hiccups with a specific upcoming lesson. It is also helpful for a teacher needing support because they need that same level of discussion and planning practice as a new teacher. Eventually, a pre-conference can be faded out of the equation as a teacher showcases their ability to conduct a solid lesson without the support of a coach. Utilizing a pre-observation note taking system ensures the lesson objective is appropriately aligned to the standard, gradual release of responsibility is used to take students from direct instruction to independent practice, as well as provide a list of common aspects to consider for successful lesson delivery. Instructional coaches can then set up the classroom observation date and time. Appointment cards are a great reminder tool to place in teacher mailboxes or slip under their door the week or day before the observation. When the day of the observation arrives, the instructional coach should grab a teacher performance evaluation rubric so that there is a common language tool to reference while watching a teacher teach. This does not necessarily need to be shared with teachers, but it is something that should be used across the administrative team. Such a rubric is aligned to school and district goals, current instructional initiatives, and teaching best practices. During the observation, the instructional coach is taking down detailed classroom observation notes. This is helpful when rating a teacher based on evidence found in the lesson delivery, as the coach can go back to the script at a later date and see the data with fresh eyes. This can also be shared with the teacher as a means to provide feedback or professional development. Speaking of feedback, it is recommended to leave the teacher with a short, written piece of guidance in the moment. For example, the coach could use feedback slips to leave a sentence or two outlining something great they saw the teacher do during the lesson and something to try or tweak for future lessons. More formal feedback will come later, but the observation itself can be nerve wracking for a teacher, so to receive a quick piece of feedback and encouragement in the moment helps ease anxiety. Along with the feedback slips, an instructional coach should leave a teacher self- reflection sheet that the teacher can use to reflect on their lesson in detail prior to meeting again with the coach to discuss the results. After an instructional coach observes a teacher in the classroom, they need to meet again to discuss how things went. This step is crucial for future improvement towards goal mastery. Prior to this meeting, the instructional coach should gather their pre-observation and observation documents to review the goals for the lesson and the actual evidence towards those goals collected during the observation. They also should review the teacher self-reflection to gain perspective on the degree to which the teacher believes they met their goals. This helps the instructional coach hone in on mindset or personal goal attributes that can be discussed during the final meeting. Using a debrief planning guide will help coaches streamline the planning process for the post conference. During this meeting, having a structure and flow for how the discussion will go not only ensures an efficient use of time, but it keeps the discussion on course. Using a debrief discussion format will help keep the conversation focused on essential components for improvement while also celebrating successes. Remember, having a thorough process in place to ensure every classroom observation is performed with clarity and precision is key to a fair evaluation process that can inspire growth in teachers. Instructional coaches are guides on the side and it is important that their position is used to help improve and inspire teachers instead of belittle and discourage them. Are you looking for more instructional coaching materials to better support teachers? Snag the bundle here. Or do you prefer to gain research-based techniques and tools to boost teacher performance and proficiency? Watch the webinar here. What tips would you add for conducting classroom observations as a coach?